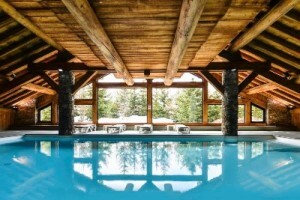 Due a last minute cancellation, Self-Catered Apartment Chamois in Meribel Village is now available for the 19th December week, and we have dropped the price from £2650 to £1450! The newly renovated apartment benefits from a south facing balcony and is centrally located – just a 2 minute walk to the chair lift. The apartment sleeps 6 people, and has an open plan dining / living area downstairs with a fire place and amazing views of the mountain. There is a double room downstairs with a vanity and a bath/shower, additionally there is a separate toilet off the lounge area. Upstairs there are two great rooms. One is a good sized double room with plenty of hanging space, the second room is a smaller double / twin room. The rooms upstairs will be sharing a bathroom which consists of a vanity, shower and toilet. We also offer some fantastic self-catered upgrades – meaning you can still make the most of our wonderful chefs – with pre-prepared meals or even have them come to the apartment for an evening to cook for you. We also offer a mid-week clean, daily fresh bread and pastry delivery, breakfast hampers and more. So if you feel like a last minute trip away next week at an UNBEATABLE price, get in touch asap!